There has been this ad on the radio for strawberry salad at Souplantation and it captured my imagination. For the record, I don’t like Souplantation. The food is generally pretty terrible but I used to go there with a friend who is a pretty competitive athlete and he loved this place for the value proposition of getting a ton of food that was pretty healthy for cheap. I would rather pay more and eat something amazing that was made just for me because I ordered it. I guess I’m a snob like that. I also need like one one thousandth of the calories that my friend needs in a day so it’s not like I’m going broke feeding myself. If anything, I could eat less. I know some of you, or most of you, know what I’m talking about. It was pretty hard not to just shove all those delicious berries right into my face but I needed them to give life to the lettuce in the form of an amazing salad. I did pop a few into my mouth while I cut and trimmed the stems off and they were like candy. So sweet and fragrant. No bitter white spots near the top. Just strawberry perfection through and through. They definitely took the salad to the next level. To make the dressing, place the balsamic vinegar, Dijon mustard, honey, shallot, garlic, salt, and pepper in the bowl of a mini food processor. Pulse until blended. Slowly pour in the olive oil, and pulse again until thoroughly blended. Set aside or refrigerate until needed. 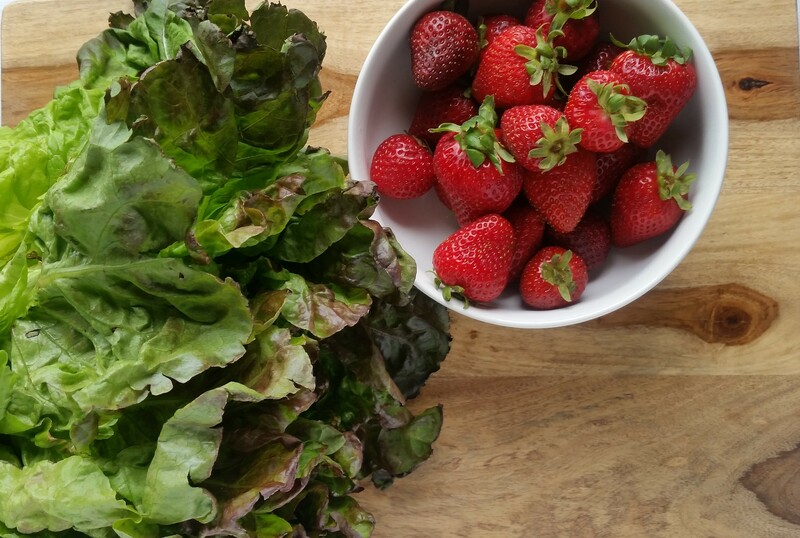 Put chopped lettuce in salad bowl and top with cheese, strawberries, almonds. Drizzle dressing over the top. Toss before plating and serve more dressing on the side… it’s really good.